Tie-Backs using A.B. Chance. CHANCE® helical tieback anchors are pre-manufactured steel anchor elements consisting of a central steel shaft and one or more helical shaped bearing plates. CHANCE® helical tieback anchors provide additional lateral support for many retaining wall designs. 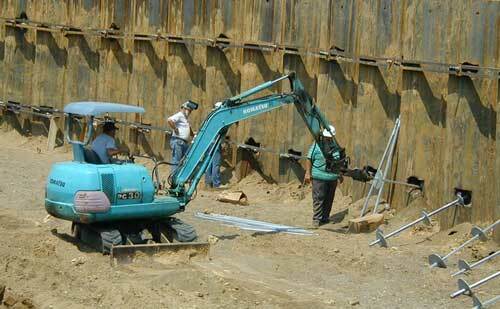 A helical tieback anchor is installed by rotating or screwing it into the ground. Each helical bearing plate is formed into a screw thread with a uniform defined pitch. The tieback anchors are installed into the ground until the helical plates are located in load bearing soil. The tieback anchor is then attached to the wall face.